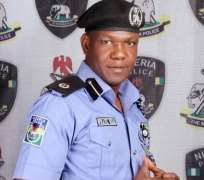 The new Inspector General of Police, Mr Abubakar Adamu Mohammed has appointed Mr Frank Mba, an Assistant Commissioner of Police as the new Public Relation Officer of the the Nigeria Police Force. The Deputy Force Public Relations, Mr Aremu Adeniran in a statement made available to The Nigerian Voice confirmed that Mba replaced Mr Moshood Jimoh, an acting Deputy Commissioner of Police. Adeniran said the posting of MBA as Force PRO is with immediate effect and that Mba has since assumed duty as the Force Public Relations Officer (FPRO), Force Headquarters, Abuja. Mba was working at the Special Fraud Unit (SFU), Ikoyi- Lagos until his appointment as Force PRO. Frank Mba, an Assistant Commissioner of Police and a Lawyer, is an alumnus of the University of Lagos where he studied Law. He also has a Masters Degree in Law from the University of Dundee, Scotland- United Kingdom. A product of the Nigeria Police Academy, Kano where he had his initial police trainings, Mba is a graduate of the prestigious FBI National Academy, Quantico- USA. He also holds a Certificate in National and International Security from the Harvard University, USA. Adeniran said the new Inspector General of Police charged Mba to bring his wealth of experience to bear in revamping the image of the Force, improving the relationship between the citizens and the police, bridging existing communication gap between the police and its stakeholders, and assisting the IGP in realizing his mission and vision for the Force and the nation.